On 5 April, 60 road transport union representatives from 20 European countries signed a declaration urging the European Commission (EC), the European Parliament and the EU Member States to address social dumping and unfair competition in road transport, via the much awaited EC Road Initiative likely to be launched on 31 May. The signature ceremony took place in Warsaw, marking the end of the ETF Road Transport Section workshop, a meeting where transport unions planned the final details of the ETF campaign for a social road initiative launched at an ETF press conference on 30 March. 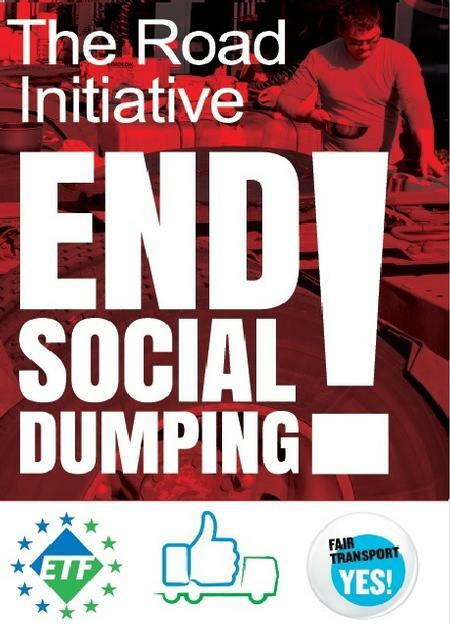 The Warsaw declaration holds the European Commission and the Member States liable against their own commitments for a strong social Europe having at its core the elimination of social dumping. The union representatives – of which eight signatories from Bulgaria, Czech Republic, FYR of Macedonia, Hungary, Lithuania, Malta, Poland, Romania – want to see promises made by the head of the European Commission Jean-Claude Juncker and by Transport Commissioner Violeta Bulc materialise in the upcoming EC Road Initiative. The Warsaw Declaration calls on the EU Member States to act along the recently signed Rome Declaration and “rally together in actively defending the dignity of hundreds of thousands of professional drivers, victims of social dumping”. “The Road Transport Initiative has been presented by the European Commission for the past three years as the opportunity to attack fraud and social dumping in road transport. Meanwhile, more than ever, the road transport sector has gradually become a heaven for criminal activity, in the context of which labour is harshly exploited and Member States face some millions of euros prejudice in social security and tax avoidance. But it recently came to the ETF attention that instead of addressing fraud, the European Commission intends to make it all legal” said Roberto Parrillo, ETF Road Transport Section President. “It is unacceptable for some Member States to do nothing but promote the interest of hauliers – be they local or letter box company subsidiaries tolerated on their territory – while their citizens are stuck for months in trucks, working and living in appalling conditions, being cheated on pay levels, and making media headlines for what we today call modern slavery. Hence the strong message ending our Declaration: In a Social Europe, competitiveness within the Internal Market cannot be built on the exploitation of its citizens!” said Tadeusz Kucharski, National Road Transport Section of NSZZ “Solidarność. The ETF Warsaw Declaration is now on its way to the European Commission, the Member States’ governments and the European Parliament. ETF trade unions will meet representatives of their national governments and Members of national and European parliaments to present the content of the Declaration, as well as the ETF concrete proposals which sadly enough have been totally ignored so far by the European Commission. The ETF campaign for a social road initiative is in its early days, but will intensify as the deadline for the publication of the Initiative is approaching. See the ETF Warsaw declaration below in English, German and French.